Grandma Fifi: Independent Costco and Aldi Blog: Random Costco News of the Week: What your grocery store says about you! Random Costco News of the Week: What your grocery store says about you! The Washington Post reported on a fascinating study done by the Scarborough research group. Unfortunately, I can't find the report on the Scarborough website, so I'm not sure about the Washington Post's interpretation, which is confusing to me. They claim the report shows that Republicans tend to shop at Costco or Walmart, Democrats shop at Whole Foods and Trader Joe's, and Independents shop at smaller grocery stores like Kroger. 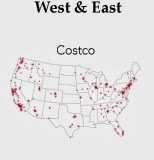 The Washington Post article also references a study showing that Costco shopping is bi-coastal, Folks in the rest of the country tend to shop at grocery stores, but on the coasts, it's Costco, Trader Joe's or Whole Foods.